Do all the headlines about torrent users getting "caught" have you worried? Here are some safer alternatives to torrenting for downloading the files you want. There are plenty of safer alternatives to torrenting. It's always unpleasant to read stories and headlines about people using torrents that get caught. However, the truth is that it is not hard to stay safe and still download the content you want. Here are the best alternatives to torrent file-sharing. People who torrent without a VPN are asking for trouble. If you want to continue torrenting but be safe while doing so, use a trusted VPN whenever you torrent. Using a torrent VPN will reliably hide your IP address and encrypt your downloading traffic. This will completely hide your torrent activities, both from your ISP and any third party snoops. If you are on a tight budget, a torrent VPN can be had for as little as $3.49 per month. Plus, some torrent VPN services also come with money-back guarantee periods of 30 days for full peace of mind. In other words, if you want to go on torrenting, go for it, but use a reliable torrent VPN! The best torrent VPN services all offer a fast, reliable, inexpensive and completely private (no logging) service to protect and hide your torrenting. While "free" VPN services may be tempting, you should avoid them as these providers have absolutely no reason to protect you if anyone comes knocking on their door about your torrent file-sharing activities. Read more about the risks of using a free VPN. Similarly, Tor (The Onion Router) is perfectly fine, reliable and free for anonymous web browsing, but it should not be used for torrent file-sharing, even according to its own web site. This is because Tor wasn't built for torrenting and will leak your true IP address if you use it to download and share torrents. Instead of torrenting your favorite movies, TV shows and other media files, you can also stream this content. With streaming, you play the media as it downloads. There are two different ways to stream content: by using streaming websites or p2p-based streaming apps such as Popcorn Time. Web streaming content is safer than torrenting because you are not sharing your IP address with dozens or hundreds of other torrent users that are sharing the same file. But you still have to trust the streaming website and hope it doesn't turn out to be a honeypot. Plus, your ISP may be able to see what you are streaming. For these reasons, we recommend that you also use a VPN service when using streaming websites. This recommendation is not as mandatory as we would recommend for torrent file-sharing (#1 above). However, for the modest expense, a VPN will protect you from any rogue streaming websites and from your nosy ISP. Web-based vs P2P-based streaming may look the same from an end-user perspective, but they are in fact very different. Streaming content via Popcorn Time has the exact same safety concerns as when you use traditional torrent file-sharing. That's because the technology for both of them is the same: the peer-to-peer (or P2P) protocol. With traditional torrenting you download a file in full and then play it. With P2P-based streaming, you watch a media file as it's being downloaded. 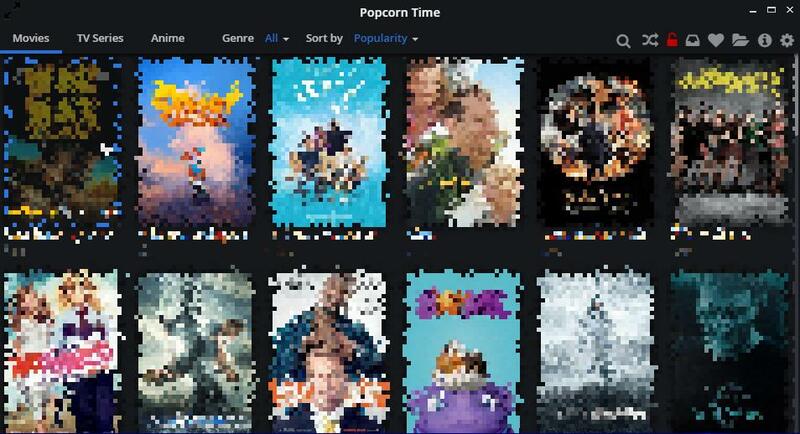 ​Popcorn Time is the most widely-known and used P2P streaming app because it is so easy to use. It works just like Netflix: after installing it, you open it and it presents you with all the latest content you can watch with a single click. In fact, Popcorn Time is so easy to use that it can lull you into not taking protective measures. There is no two ways about it: just as with traditional torrenting, you must use a trusted VPN with Popcorn Time. Usenet is an under-used way to download and share files, but is much safer than torrents. Usenet is completely private compared to torrents because you download files directly from the Usenet provider's servers rather than from countless strangers on public torrent networks that can be snooped on. However, the extra safety of Usenet comes with two main disadvantages. First, Usenet is a bit more complicated to learn than torrents, though just as easy after a short initial learning curve. Plus, some Usenet providers such as EasyNews are as easy to use as Google: you simply search, find and view. See our How to Guide for a quick overview of Usenet. You can even fully automate Usenet downloads to get your favorite content as soon as it becomes available. The second disadvantage is that Usenet is not free. While free Usenet access is available, this access will be limited or for a short time, so a premium service is needed especially if you are looking for a full-fledged torrent alternative. But with full service Usenet packages available for $8.50 per month, it will hardly break the bank. Check out our recommended best Usenet providers today. All the advantages of the torrent alternatives listed above can be achieved with a cloud-based service. For a modest monthly fee, you can use a cloud-based file downloader to do all the work for you. Instead of downloading files using your computer, your software and your Internet connection (and your personal IP address! ), everything is done in the cloud. The cloud-based service hosts apps that you can use to download torrents, grab streaming videos, and even download from Usenet newsgroups. The service then save these files to your private storage space in the cloud. You leave zero fingerprints behind. Once the files are saved in the cloud, you can stream them in complete safety right from your cloud storage space or download the files to your own computer and other devices for enjoying later or while offline. The big advantage of this method is your interactions are only with the cloud service, so your downloads can never be traced back to you (provided the cloud service can be trusted). The cloud service does all the torrenting work on your behalf and then you simply manage the completed files from the cloud server. It's also no surprise that the cloud service can download files much faster than you ever could. If this sounds like a good option for you, check out our recommended cloud downloader services (they all support torrenting and some support Usenet too). By now, you should be all caught up on the best alternatives to torrent file-sharing. Whether torrenting with a VPN, streaming content, downloading from Usenet newsgroups or embracing a cloud-based downloader, you have many safer choices available.